* Regularly cover race, diversity and inclusion in the outdoors. * National awards for writing, photography and Web publishing. * Keynoter, panelist and consultant. * Founded and sold website to ESPN. * Co-founded website sold to FOX. * Managed large and small media staffs. * Companies at the forefront of social networking and media. * Newspaper sports columnist and reporter. At Snow Lake in Mount Rainier National Park. 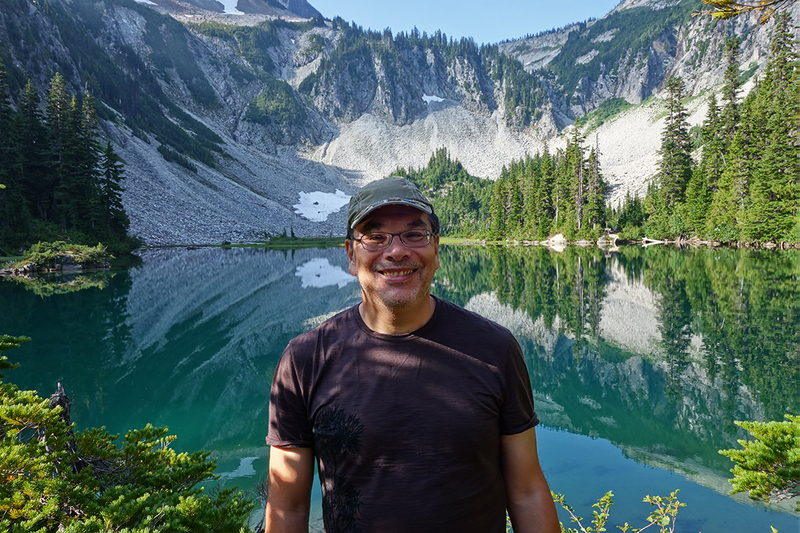 Based in Seattle, Wash., Glenn Nelson is the founder of The Trail Posse, which regularly covers race, diversity and inclusion in the outdoors. He is a founding member of the Next 100 Coalition, a national alliance of civil rights and community and conservation groups of color that advocate for more inclusive management of public lands. Glenn has won several national awards for his writing, photography and Web publishing. His most recent national honor was second place for Outstanding Beat Reporting (Race, Inclusion and Environmental Justice) by the Society of Environmental Journalists (SEJ) in 2017. A graduate of Seattle University and Columbia University, he started his career at The Seattle Times. He later founded HoopGurlz (now at ESPN), which covered girl’s basketball and college prospects nationally, and helped found Scout.com, a network of college and pro sports websites. Nelson is the primary author of a teen book about the NBA, has been published in numerous magazines and book collections, had a photo in a Smithsonian exhibit, and has been profiled by NPR. He also serves on the boards of Audubon Washington and Friends of the Waterfront Seattle, as well as the Washington Governor’s Outdoor Recreation Advisory Committee. Hey Glenn: I just realized that we’ve met. A number of years ago, I did a feature on you for Seattle University’s SUN magazine. I knew your name rang a bell! Chuck Taylor put a link in a Tweet about your reaction to the new online P-I … nice to get reacquainted! I’m still freelancing; write for Crosscut but mainly do travel. Although the outlets are dying at a dramatic rate, so between magazines and newspapers, it’s a tough gig. The Internet is where it’s at … and then there’s the problem of how to make $$. Still on Whidbey Island and all in all, life is pretty great! Funny, I just responded to your other comment about this. Good to hear from you. OK, since you were on my “About” page, you know I started a Web site about girl’s basketball, sold it to ESPN and now run it for them. Glad to hear you are still finding outlets for your writing. Travel is the ultimate subject matter (besides basketball and jazz). I set up a Facebook fan page for Thomas, by the way. If you are on FB, become a fan! I just read what you wrote about Susan Cronins . ( april 2012 ) I grew upon Capitol Hill with Her kids . ( Sean and kathy ). My brother and I have been looking for years to find them and he just passed this on to me .